Did you know that there is a ghost at the popular Tavern on Main in Chepachet? Well, we did, which is one of the reasons we visited this adorable inn built in 1800. What we didn't expect to happen was that the ghost would "appear" in our dining room shot! Mom and I arrived here, after taking a scenic autumn drive down Putnam Pike, at around 3:30 p.m.
We parked in the back of the restaurant and went inside. What we didn't know was that this restaurant used to be called the Stage Coach Inn, presumably a stop in the year 1800 for all the various stage coaches that were looking for a room for the night. I'm not sure if it is still a working inn, but I swear I saw someone going up the stairs with suitcases. 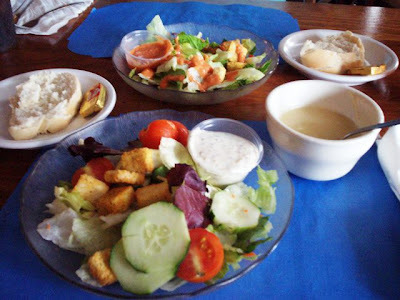 Mom and I decided to eat in the dining room, although we heard that the ghost was often seen in the tavern. We were greeted by our waitress, who we only know by the initial D, and she took our drink order - two diet colas ($2 each). After choosing our entrees, D informed Mom and I that we could help ourselves to the soup station, which contained a large crock of potato cheddar soup. She also mentioned that there was a loaf of bread up there as well. How quaint! Since Mom wasn't interested in that particular flavor of soup, I helped myself to a cup and cut two slices from an Italian style bread. The soup was extraordinarily flavorful and filled with chopped potatoes, and the bread was soft and fresh. Salads also came with our meal, and for our dressings, Mom chose the homemade French while I went with a Parmesan peppercorn. They were outstanding. As we waited, Mom and I both talked about how much we wanted to live at this restaurant. We just loved the authenticity of the place, complete with warped floors, low ceilings, mismatched furniture, and antique appliances. It was decorated for Halloween, and according to a flyer I found at the front desk, some ghost hunting was going to be done at the restaurant to try and make contact with Tavern on Main's resident spirit. Now, it seems that ghosts avoid me like the plague as I've never had any sort of "experience" aside from smelling some displaced perfume at a local cemetery when I was walking alone, but we do think that we may have caught the ghost on film! Check out the picture below of the beautiful dining room. What the heck is going on with all the orbs (circled in green)? I read that orbs are a sign of spirits. Well, according to the picture below, it seems that four spirits were dining with us. Now, we know what you're thinking - so what? 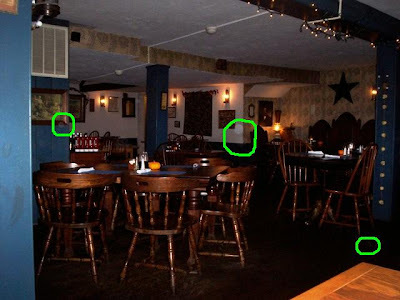 Well, according to the video captured on the restaurant's Web site, there is a floating orb almost EXACTLY where these orbs are in this photo. What are the odds that two ghostly things would happen in the same spot? I think we really have something here! CLICK HERE FOR THE GHOST VIDEO. 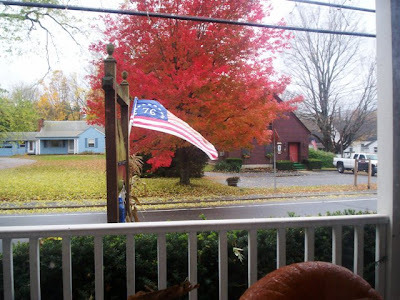 The view from our window was gorgeous. We just love living in New England at this time of year! After gazing out the window and trying to figure out how we could move into the restaurant without the staff knowing, our entrees arrived. 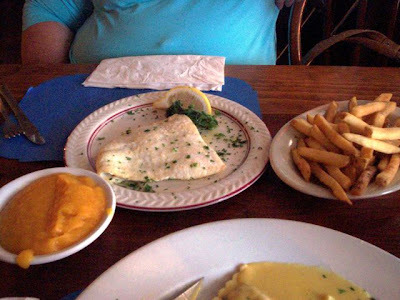 Mom ordered the haddock with her choice of fries and butternut squash ($14). I chose the pecan chicken ($15) which came resting on a plate of butternut squash ravioli. I had been obsessing about this dish ever since Mom described it to me from the restaurant's Web site. We also ordered an appetizer of crab cakes ($8) ... which never showed up. We thought that the waitress had written it down, but alas, she hadn't. We were going to say something, but our plates of food looked so large that we thought that not getting the crab cakes might have been a saving grace. We would just have to pay attention to the bill to make sure that we weren't charged for them. Mom's haddock was a very good size piece. She had asked for it broiled, with nothing on it, and got exactly what she wanted. The fish was perfectly done. It was flaky and fell apart with the touch of her fork. She said the fries were good and the butternut squash was sweet and tasty - the surprise hit of her meal! 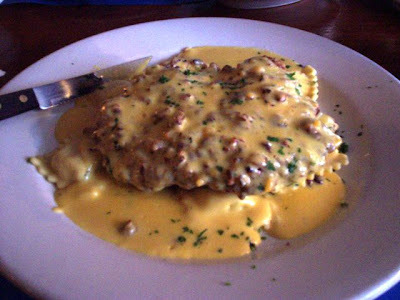 After eating this dish, I never want to see another pecan as long as I live. It was excellent! The chicken was moist, perfectly cooked, and surrounded by large, meaty pecans. The butternut cream sauce was tasty and the raviolis were stuffed with squash filling. This was one of the heaviest dishes I have ever eaten, and I was beyond surprised that I finished the entire plate. I just couldn't stop - it was too good! We left $43 on the table, which included a 20% tip for D, even though she seemed a bit distracted during our visit. Before leaving the restaurant, Mom and I visited the ladies' room. It was very cramped, but the stalls were roomy and everything was clean and neat. Tavern on Main just may be our new favorite restaurant. 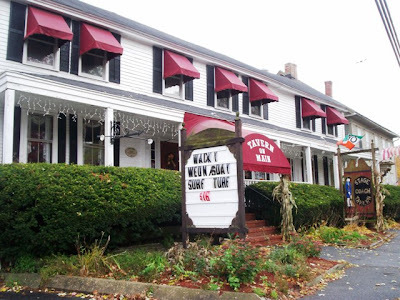 It is a unique place to eat, especially if you're new to New England. The food was outstanding and they have quite a vast menu. As for the ghost, Mom and I are surprised that it possibly showed up in our photo. We don't usually take photos on our second visit to a restaurant, but I will definitely bring my camera the next time around. Who knows, maybe the ghost will be kind enough to pick up the tab! Please click here for the Tavern on Main hours of operation.